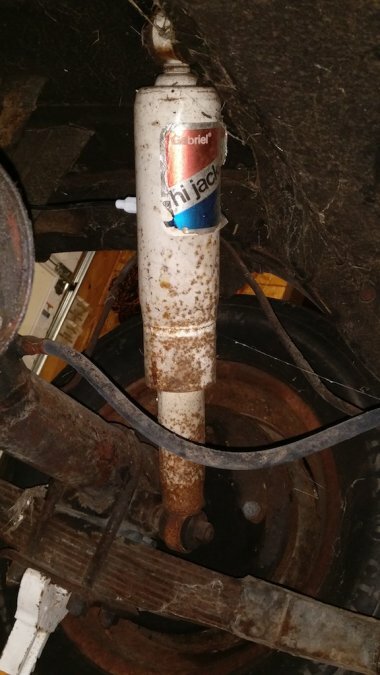 I'm dissembling the '52 Suburban and found Gabriel Hi-Jacker air shocks on the rear. The schraeder valve still had the cap on and the lines were hooked up, so why not test them out, I thought to myself. To my amazement, they worked and raised the wagon at least 4 inches! They are holding air after one week. The last time the vehicle was registered was 1979. Good ole American quality! After reading about air shocks, all the major manufacturers (Gabriel, Monroe, etc) describe them "for towing or hauling heavy loads" but nothing about adjusting ride height for all the time driving. 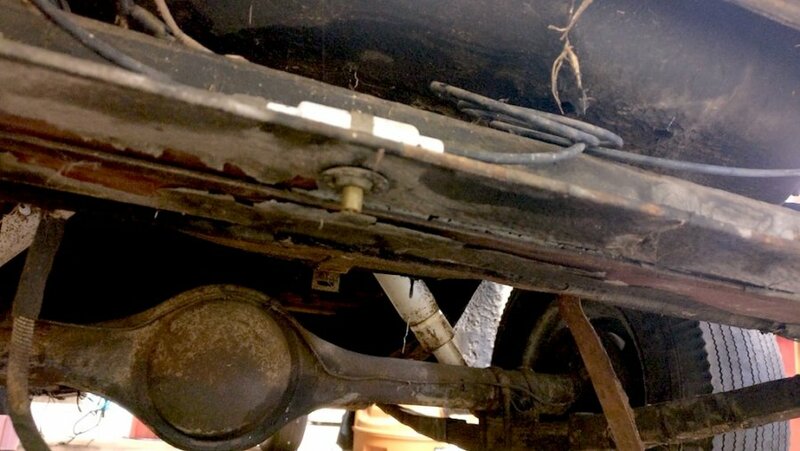 How many forum members are running air shocks? Any reason why I might want to replace them with modern air shocks, vs the standard rear shocks? I will be using Rusty Hope's shock relocation brackets for the front. I've got air shocks on the rear of my 47 3 window. I put them at the height that I wanted it at 18 months ago. Haven't touched them since. 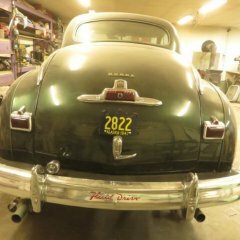 I use air shocks(new) on my 50 Plymouth 4 dr.. Put them on because the original springs were OK for normal driving but say crossing RR tracks the bounce was to much-I felt even with new Monroe shocks installed. Found some air shocks on Ebay or Amazon for a reasonable price so I tied them. Found the correct app by the sale adds on EBay to fit ,then went internet shopping for price with shipping. You all ready have some so new paint?? i Put just enough air in them to barely raise the rear body. Ended up at 50-55 lbs. Now crossing RR tracks it does better than my much newer car (still not a new car-100k miles). Just something to think about...….. springs and their mounting hardware are designed to support vehicle weight, shocks and mounting points for them might not be able to. So true! Reminds me, back in the day they were really popular with tri-five Chevy guys, really jacked them up for that look.. Stock upper mount location was the trunk floor! I've seen more than one shock sticking up into the trunk when the weight and rough roads became too much. I have been running a pair on my 39 for at least thirty years. Agree with all posted, a little bit of air can be helpful, but you can't jack them up with 80lbs of air and try to compensate for worn springs. Not sure of the dynamics involved, but I've also heard too much air can break the bolt holding the leaf spring together. I have separate air fill lines for each shock, and its fun to play around with air pressures and how it affects "launch" from a stop. More air in the right shock makes a difference as far as traction. Everyday driving, maybe run 10-15 pounds both sides.